Standard BGA in box 7 : Here you can unload everything as usual . BGA freight station : Here chaff and straw is assumed . In the two silos at the barn just shredded ‘s quality is to be accepted , to have silage. In the nursery , there are 2 additional outlets for slurry and manure in MP since it sometimes came to a crowd here . Straw can be sold at the nursery too. The new pig of Marhu was added – there are two plants of it. The plant was converted to Xtreme Power . A camp for chaff was inserted. 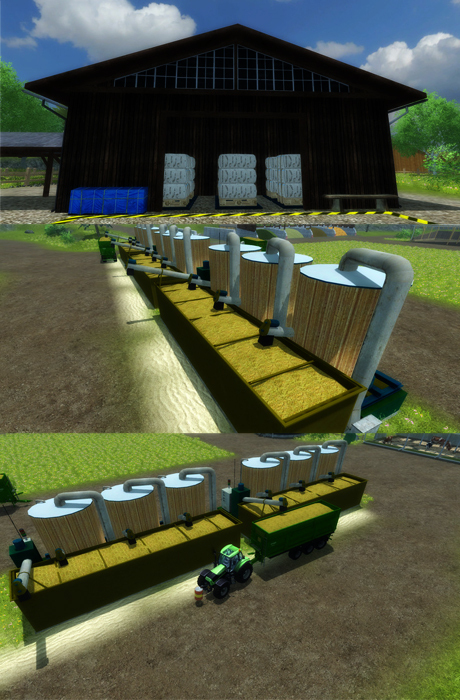 A new manure conveyor belt at the barn to muck directly . The accompanying mods were slightly adjusted so that something come along better SP player. A lot of little things under the hood , but now that I do not list them all , because for the user so this is all important works. The executor Hall the Court was inserted. For field 3, the hall has been replaced. The great hall in the sheep pasture was replaced. The hall at Block 13 has been removed . Bergmann Tera comes for the first time used. Liebherr wheel loaders are available with more power. Deutz TTV TTV 6190 and 7250 were equipped with auxiliary power . The fermentation times have been extended and optimized to a time setting of 15x . What has changed 11.1 ? In the Wollpalletten an automatic projector was inserted consisting of spinning over the Wollpalletten Official required once . When mixing an Xtreme Turbo screw was inserted to the compound feed followers to fill quickly , so the food is still fresh to the animals. Hall devices in the Amazon has migrated. A few minor blemishes I’ve also been corrected .